We’ve had a lot of cold and rain and we had some lambs born in the irrigation ditch that were cold. So we made a small lamb box to put the one colder lamb in for a few hours. It worked well and by the time the lamb got warm and climbed out everything was fine. 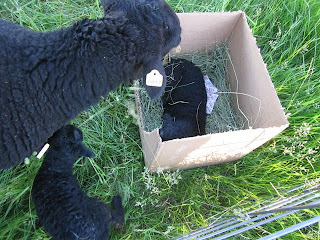 The hay in the box ensured mom stayed with her nose right in there to talk to the lamb. Brad Burritt is back to start the second large sola PV system. 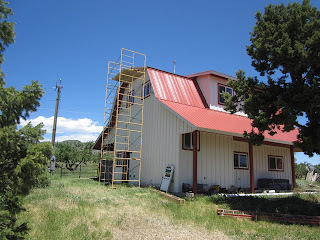 It’s going on the shop roof and will be a grid intertied system that supplies power to the Little House, Shop and Red Barn.